The Grey could be used as an anti-tourism ad for Alaska: your plane will crash in the snowy wilderness somewhere and you will get eaten by wolves ... welcome! However, the film was better than I expected - even if it's grisly and bloody in parts - and Liam Neeson gives a great performance, as does his supporting co-stars. Ottway (Liam Neeson, Unknown) is preparing to fly back to Anchorage with his coworkers. He is a hunter of sorts for the company; he kills wolves when he sees them get too close to where the men are working outside. Ottway just wants to be left alone so he can sleep, he tells the man who sits next to him (Joe Anderson, The Crazies), whom quickly switches seats when he encounters the grouchy Ottway. The plane hits some turbulence mid-flight, and a digital map shows they are somewhere over Alaska. What follows is most intense plane crash I have seen in any movie, even including some 9/11 films. When Neeson wakes up, he is shivering and his face is half-covered with snow; he appears to be alone, but when he walks over the snowbank, he sees the wreckage of the plane and bodies and suitcases strewn everywhere. He quickly finds himself a hat and a heavier coat out of one of the suitcases, and then looks for survivors - there are no more than ten. They huddle in the plane and try to decide what to do, and Ottway quickly establishes himself as the leader of the group, because of his survival skills. This is a good thing because on their first night they encounter an unpleasant surprise: there is a pack of wolves in the area who are angry at them for disturbing their hunting space. Ottway and the others decide to head for the trees in an effort to avoid the wolves, but the survivors soon begin to be picked off one by one. This movie was a lot scarier and a lot bloodier than I thought it would be, but the overall story was excellent. 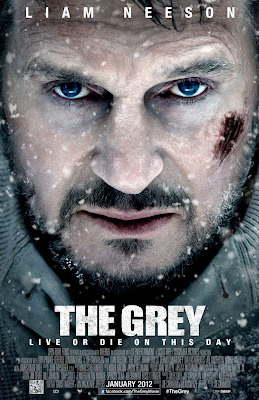 The Grey really gets into the minds of the survivors, especially Neeson's character, who was thinking of committing suicide at the beginning of the film, pre-plane crash, and this is where it excels. The scenes where people get eaten and mangled by the wolves are not for the faint of heart, and I found myself cringing a few times at all of the bloodshed. Neeson's fellow survivors include an unrecognizable Dermot Mulroney (J. Edgar), Dallas Roberts (TV's The Good Wife), and Frank Grillo (Warrior), to name a few, and with their host of different personalities they provide an interesting group of people. Maybe see this film. I enjoyed it more than I thought I would, and the ending will have you thinking about it long after the last scene, but its not for everyone - if you are averse to bloody scenes and/or major plane crashes, then you should definitely skip it. Be advised, too, that there is an additional scene after the credits, although it's only about three to five seconds long; so if you do see the movie, don't forget to stay for that. The Grey is one of the best "disaster movies" I've seen lately, but it's not the easiest to watch unfurl. The Grey is in theaters today, January 27th, and is rated R with a runtime of 117 minutes. 3.5 stars out of 5.